A woman is having laser treatment to resurface her face. Laser resurfacing is used to reduce the appearance of mild-to-moderate facial wrinkles without the need for costly plastic surgery. Because the procedure is not invasive, patients can expect a quick recovery period and a reduced chance of complications compared to surgical procedures. Laser resurfacing is performed by a dermatologist or plastic surgeon and can be completed in one or more treatments, depending on the amount of wrinkling. Lasers use a thin, targeted beam of light to remove or resurface areas of the skin. Because lasers can be precisely targeted, very small areas of the body can be treated without damaging adjacent areas. Ablative lasers burn off the top layer of skin and encourage the growth of new collagen in the tissues of the face. Collagen is a natural protein that promotes skin elasticity and firmness. As the wound caused by the ablative laser heals, the new skin that forms is tighter and smoother. Non-ablative lasers work by promoting new collagen growth in tissue under the skin. These lasers don’t vaporize skin layers, so the recovery period is shorter. Fractionated lasers are used to pinpoint very small areas of the skin, such as the area around the eyes. During treatment, a combination of laser types may be used to address specific problem areas. Laser resurfacing targets both static and dynamic facial wrinkles. Static wrinkles are always evident, while dynamic wrinkles only appear when expression changes. Laser resurfacing is also used to improve the appearance of sun-damaged skin, liver spots, skin tone, age spots, scars, freckles, sun spots, dark patches of skin and blood vessels visible on the face. Laser resurfacing isn’t effective in removing sagging skin or deep wrinkles, according to the Mayo Clinic. Before undergoing laser resurfacing, your doctor may recommend an antibiotic to prevent infection and antiviral and antifungal medications to prevent complications from a dormant virus that may be awakened by the procedure. You may also be asked to prepare your skin by applying special lotions or creams. Before the procedure, you will be sedated or will receive local or general anesthesia. 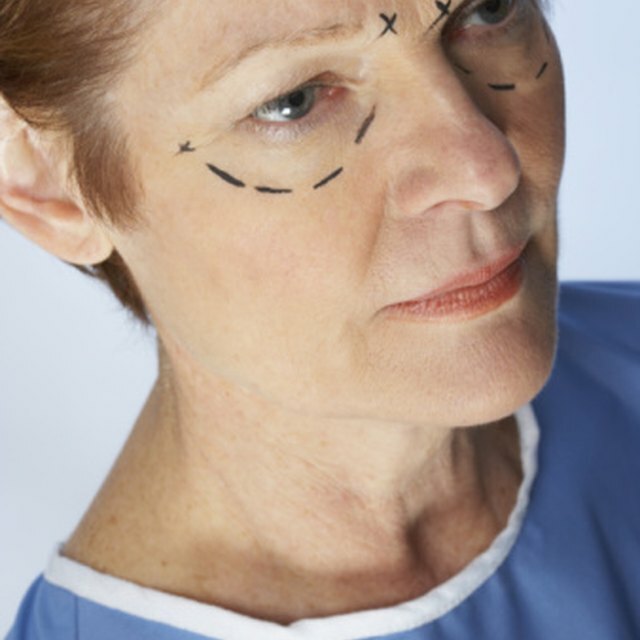 General anesthesia may be required if the laser is targeting deep skin tissues. During the treatment, the doctor will aim the laser at the various areas of the skin. Treatment may take up to one hour, depending on the extent of your wrinkles. When the laser passes over your skin, you may feel a slight stinging sensation. Protective ointment will be applied to your face after the treatment. In some cases, areas of the face will also be bandaged. Pain medication and ice packs can be helpful in reducing swelling and pain following laser skin resurfacing. The treated area may look red and develop crusts after treatment, and your skin may appear pink for weeks. According to the Consumer Guide to Plastic Surgery, sun exposure should be avoided until the skin no longer looks pink. When you can spend time in the sun again, you'll need sunscreen with a sun protection factor (SPF) of 30 or higher. You may need to arrange for someone to drive you home after laser skin resurfacing due to the lingering effects of the anesthesia or sedation. What Is the Downtime for a Photofacial?